SKU: 703447032473 Categories: Protein Food, Bars Tag: Ready to Enjoy! The Bari Life Crispy Caramel Sea Salt Protein Bar delivers on delicious taste, optimal convenience and bariatric nutrition. Not only is this protein bar packed with high quality protein, but it’s packed with fiber too! If you love salted caramel then you are going to LOVE this protein bar! A good snack has enough protein to tide you over until the next meal, but not too many calories or carbs. 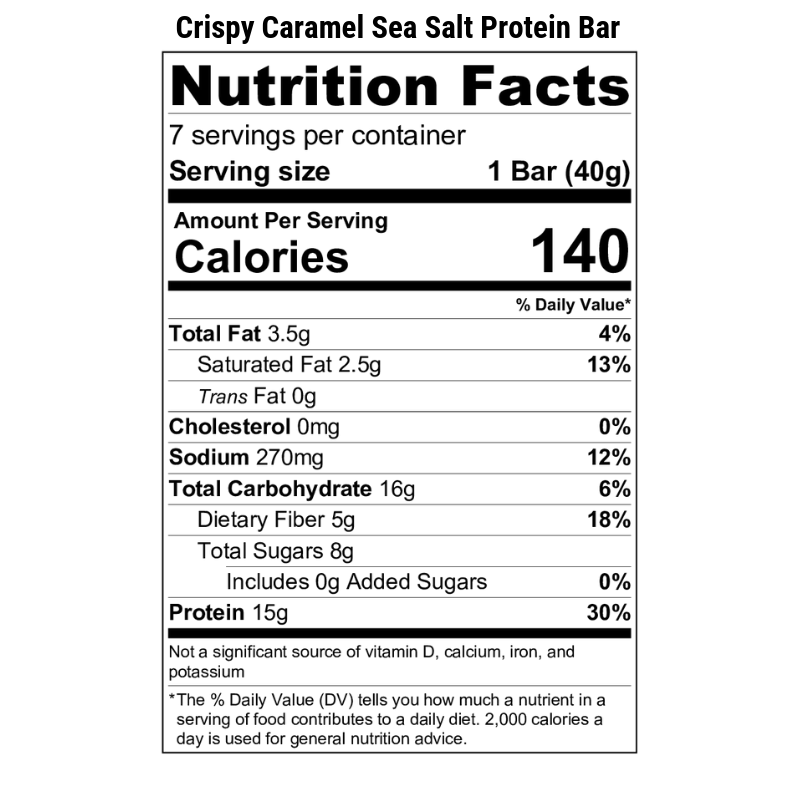 Our Crispy Caramel Sea Salt Protein Bars are suitable for the solid foods and maintenance diets and are perfect for gastric sleeve, gastric bypass, duodenal switch and gastric band patients. Since Bari Life protein bars were originally created for medical weight loss diets they are a fantastic option for anyone watching their weight! Enjoy them as an on the go breakfast or snack. Also, a top protein packed option for athletes and overall healthy living. This protein bar has just the right amount of savory sweetness to satisfy any craving that comes your way, not to mention 5 grams of fiber and 15 grams of filling protein! You can’t go wrong with this perfectly crisp chewy duo that is undeniably delicious and healthy! You can’t predict what might happen in your busy life, but you can always be prepared. Keep Bari Life protein bars in your office, backpack, car and gym bag so you will always able to satisfy hunger no matter where you are. For guidance on how to use this item as part of a healthy weight loss plan click here view our Bariatric Diet Plan. Protein Blend (Soy Protein Isolate, Whey Protein Isolate, Dried Egg Whites), Salted Caramel Flavored Coating (Sugar, Palm Kernel Oil, Nonfat Dry Milk Solids, Whole Milk Solids, Salt, Artificial Color (Yellow Lake #6, Yellow Lake #5, Blue Lake #2), Soy Lecithin [an emulsifier], and Natural Flavor), Prebiotic Dietary Vegetable Fiber, Invert Cane Syrup, Water, Tapioca Starch, Xylitol, Natural Flavors, Vegetable Glycerin, Salt, Caramel Color, Xanthan Gum, Stevia.